There’s a bounty of wonderful fall ideas and decor waiting for you in Country Sampler’s September 2016 issue! Visit country homes dressed for the harvest. See smartly repurposed salvaged finds in our Thrifty Thinking section, and check out the gourd-eous accessories in Country Treasures. Read up on seasonal goods in Antiques Q&A, and discover hints for autumn decorating in our Decorating with Crafts section. Bring all this inspiration into your home when you shop our Craft Fair for the latest in country furnishings, decor, gifts and more! Don't miss a thing -- download now! August/September Country Sampler 2016  $6.9932 in stock. I purchase a subscription for my friend and myself every year. My friend looks forward to this as part of her birthday gift and even sends me a text with a photo of a special page she may find always saying "thank you, thank you, thank you". This is my go-to book for all my decorating tips. I just love the photos and colors used. 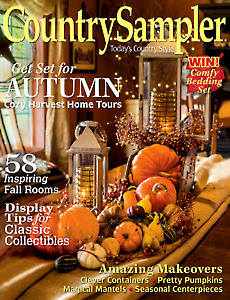 Other magazines "claim" they are country however they don't seem to capture the feeling that Country Sampler provides. Love this magazine! First time I have purchased this book. Both my husband and I love it, and plan to subscribe. Thank you for making it so fun & easy!! !